International environmental organisations brought their protest against Canada for their refusal to take back the 50 shipment containers filled with household waste dumped in the Philippines almost two years ago, raised the matter at a high-level meeting of the Basel Convention and marched from that meeting to the Permanent Mission of Canada, in Geneva, Switzerland. 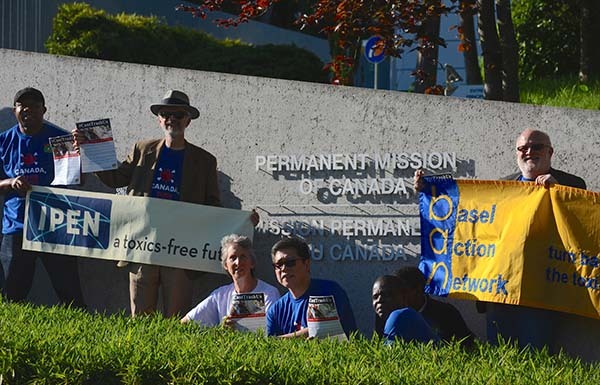 Environmental justice groups Ban Toxics (BT), the Basel Action Network (BAN), the International POPs Elimination Network (IPEN), the Pesticide Action Network, and EarthJustice, participated in calling on the Canadian government to comply with their obligations under the Basel Convention on the Transboundary Movement of Hazardous Wastes and Their Disposal, to which both the Philippines and Canada are both Parties, to take back their illegal shipment and to prosecute the exporter. BAN Toxics director Richard Gutierrez delivered a stinging speech before the delegates representing the 183 country members of the Basel Convention. The Basel Convention prohibits trade of toxic and other wastes unless a country consents to it, and it requires the exporting country to take back illegal shipments and treat them as criminal but the Canadian government is dodging its responsibility by saying that they lack the domestic legislation to prosecute the exporter and it is therefore a “private matter” between the Canadian exporter, Chronic Inc., and its Filipino counterpart, Chronic Plastics. “Diplomatic bullying has snuffed the Philippines’ resolve to enforce Basel. But even if the Philippines does not complain, such non-compliance cannot simply be forgotten. Bilateral non-Compliance is not acceptable under the Convention,” said Atty. Gutierrez. After his state visit to the United States and Canada, Philippine President Benigno Aquino III recently declared that the Canadian waste will be burned or buried in the Philippines. BT fears that disposing the Canadian waste in Philippine soil will not only set precedent for other rich countries’ to dump their waste in the Philippines, exposing the surrounding communities with toxic fumes emitted through cement kilns and hazardous leachate from landfill disposal. BAN and Ban Toxics will be lodging an official non-Compliance charge against Canada with the Secretariat of the Basel Convention. email: jpuckett@ban.org, phone: +1 (206) 652-5555.
email: rgutierrez@bantoxics.org, phone: +1 (587) 351-2635. Founded in 1997, the Basel Action Network is a 501(c)3 charitable organization of the United States, based in Seattle, WA. BAN is the world’s only organization focused on confronting the global environmental justice and economic inefficiency of toxic trade and its devastating impacts. Today, BAN serves as the information clearinghouse on the subject of waste trade for journalists, academics, and the general public. Through its investigations, BAN uncovered the tragedy of hazardous electronic waste dumping in developing countries. For more information, see www.BAN.org or blog.BAN.org. BAN Toxics (BT) is an independent non-government environmental organization focused on the advancement of environmental justice, children’s health, and toxics elimination. Working closely with partner communities and other NGOs in both the local and international levels, BT endeavors to reduce and eliminate the use of harmful toxins through education campaigns, training and awareness-raising, and policy-building and advocacy programs. BT acknowledges the support of the Swedish Society for Nature Conservation in its work on global chemicals management issues.